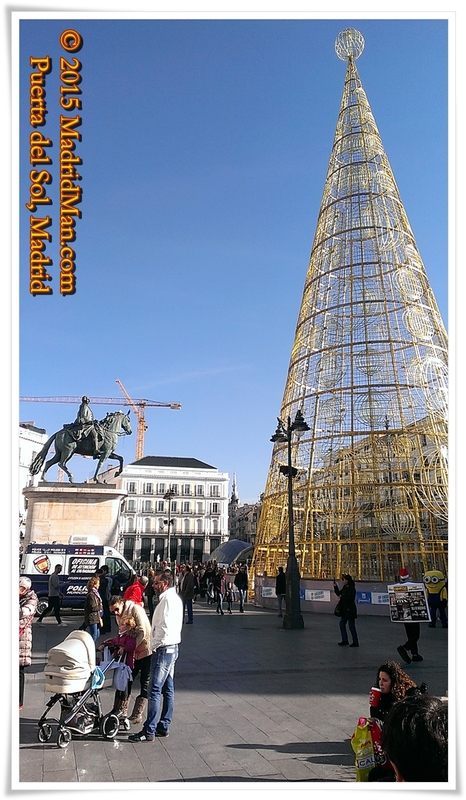 In Madrid, and in Spain in general, the Christmas holiday lasts roughly two weeks. Some families celebrate Santa Claus “Papá Noel” on the 25th of December while other families celebrate the Three Wise Men “Los Reyes Magos” on the 6th of January. And some families celebrate both. I’ve heard arguments in favor of one or the other or both, but most parents recognize the usefulness of giving toys on the 25th of December in order to allow children more time to play with them during their Christmas break. Madrid’s Mayor announced a serious cut-back on Christmas lights in the city this year in order to save money, but you can’t tell at all. Maybe they hung fewer lights outside of the downtown area. 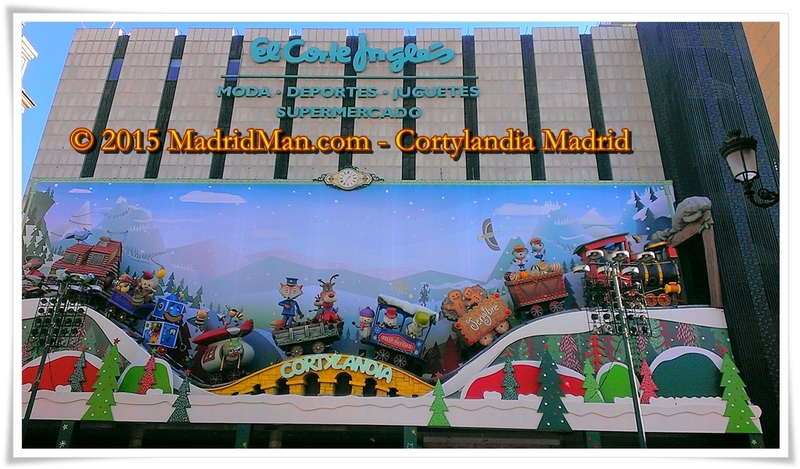 To the casual eye, Christmastime in Madrid looks as good as every year. 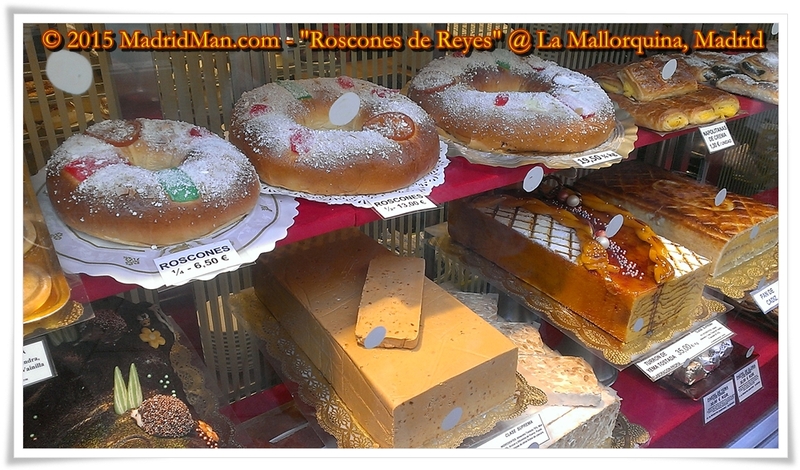 We’ve already bought our turrón, our polvorones, and will wait a day or two before “Reyes” (6th of January) to buy our first “Roscón de Reyes“. I prefer the ones filled with cream, but others like theirs filled with chocolate or just nothing. Regardless of the roscón, SOMEONE has to cut-into the little toy hidden inside, which means they have to buy the roscón next year. And while Spain is still in a deep economic crisis, it’s certainly not evident while walking the streets of Madrid in Christmas. Maybe people are spending less money, but the streets are still practically impassible with hoards of people, the bars and restaurants are all full, the lines are long at shops and shopping centers, and the general “feeling” seems every bit as joyous as every year. 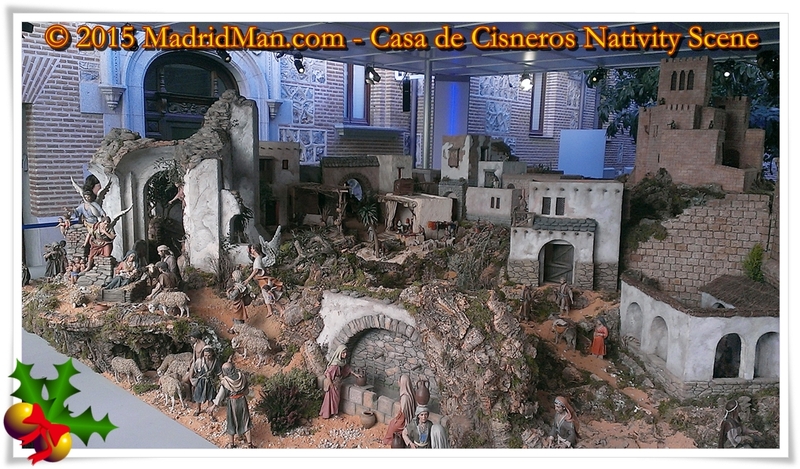 As every year, one can visit the large Nativity Scene in the Real Casa de Correos, but expect long lines to see it. I visited one inside the patio of the Casa de Cisneros on the Plaza de la Villa. It’s really quite nice! Plaza Mayor’s Christmas Market is as big – and as popular – as ever. Here, the Christmas lights are particularly nice, criss-crossing the plaza and hanging over the dozens of stands below selling nativity scene figurines and Christmas decorations. Puerta del Sol’s lights are simpler and home to Madrid’s tallest Christmas tree, the same one as the last two years – sponsored by the National Lottery Commission. At midnight on New Year’s Eve in Madrid, thousands of onlookers will fill the Puerta del Sol, awaiting the 12-chimes of midnight and the dropping of the golden ball from the Real Casa de Correos’ clock-tower to ring-in the new year, 2016. As the custom goes, Spaniards are to eat one grape with every chime of midnight. Achieving this not-so-easy task will give good luck throughout the next year. The final Christmas in Madrid event will be the annual “Cabalgata de Reyes” Parade (“Three Wise Men Parade“) on the 5th of January 2016, the night before the National holiday. It officially starts at 6:30pm and passes slowly down the Paseo de la Castellana/Paseo de Recoletos to the Plaza de la Cibeles where the Three Wise Men will address boys, girls, and adults with their Christmas message at 9pm. Last year you could watch live online via RTVE.es. So that’s it for MadridMan® and MadridMan.com for 2015. Let’s hope 2016 brings unexpected pleasure and success to each and every one of us. Merry Christmas, Happy New Year, and Happy Holidays to one and all. This entry was posted in About Spain, General, Photos and tagged 2015, belen, Cabalgata de Reyes, Cabalgata de Reyes Magos, Christmas, Christmas Lights, Madrid, Madrid Christmas Lights, Nativity Scene, plaza mayor, polverones, Puerta del Sol, roscón de reyes, turron. Bookmark the permalink. The Spanish Siesta: Fact, Fiction – or Envy?